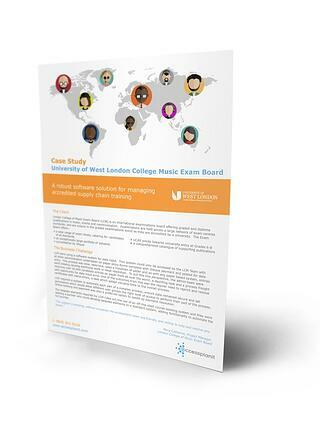 The University of West London's London College of Music Exam Board (LCM) is an international examinations board. It offers qualifications in music, drama and communication. Implemented a training management system that supports faster, more accurate operations. Prior to implementing the accessplanit training management software, the LCM was reliant on a locked-down software system, inaccessible outside of the Â team. As such, all other processes employed a paper-based system. With over 20,000 candidate entries globally, the LCM's processes were time-consuming and open to error. What they needed was a training management system capable of automating every part of the process. This had to include varying levels of admin access and online booking. By choosing the accessplanit training success platform, the LCM offers a greatly enhanced learner experience - no matter where in the world their delegates are based. Our online course booking module has increased their annual bookings to more than 90,000, using a variety of instant payment methods. Administrators also gained access to more efficient and intelligent course scheduling. Get your free case study today, and explore how together we cut UWL's exam cycles from 6 weeks to 6 days.